The availability and lead time for each item is shown on the item detail page (see screenshots below for examples and explanations). Items marked "In Stock", including many customized items, ship from our warehouses located in northern and southern California. Items marked as "Made to Order" ship directly from our various manufacturer partners, which are located across the country. We also offer expedited shipping methods for most in-stock items that can be shipped via FedEx. Made to Order items, and items shipping via pallet, generally do not offer expedited shipping methods. Please note that expedited shipments deliver Monday through Friday. Saturday Delivery is not included with expedited orders unless specified at the time of order, and costs an additional $15, which will be added to web orders if Saturday Delivery is requested. ** International duties, fees and/or taxes (if any) are not included in our shipping rates, and are payable by the customer. Low Inventory - These items are in stock at one of our California facilities, however, we have low quantities of these items. Made to Order - These items are shipped directly from the manufacturers, which are located across the country. These items typically require longer lead times and generally cannot be expedited nor gift-wrapped. On Backorder - These items are sold out. 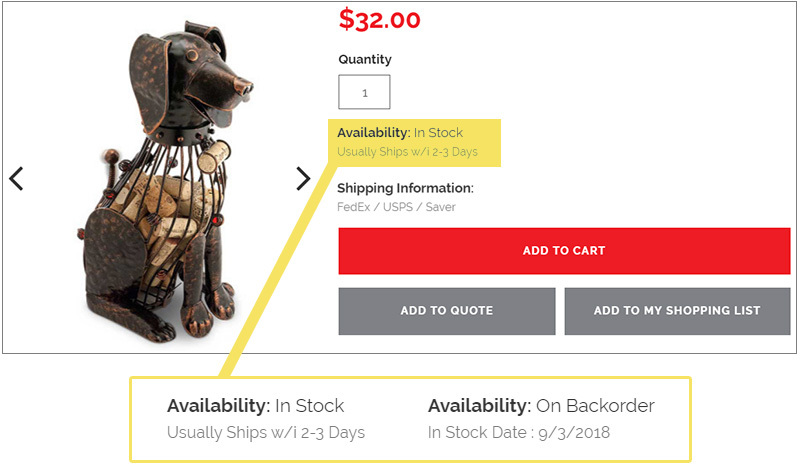 When an item is on backorder, we will display the expected in-stock date, and can be purchased for shipment when the item once again becomes available. Please note: The expected in-stock date reflects our best guess and/or guidance from the supplier. As the in-stock date changes, we will provide updates to you, but we do not control the timing until we have the stock in hand. Non-custom items: In-stock items generally will ship the same or the next business day. Custom Items: These items generally take 2 weeks to produce. It costs more, but we think it's worth it! Before we ship any orders from our Petaluma facility, we open, inspect and repackage all merchandise. Therefore, you can be certain that your order was in perfect condition before it was released to the freight carrier. At the time of delivery, customers are responsible for inspecting both the packaging and the merchandise. Orders shipped via inside delivery or common carrier: In the event that your order arrives with damage, you must describe the condition of the packaging and the merchandise on the bill of lading. Orders shipped via FedEx or USPS: If your order arrives with damage, you must report the damage within seven (7) days of receipt. In most cases, we will request a picture of the outside packaging and the damaged merchandise prior to replacement of the damaged merchandise. Failure to follow these instructions may result in a denied insurance claim and/or billings for nonrefundable freight charges. In the event of freight damage, the freight company has, at its discretion, the right to repair or replace the damaged item, provided that the item is in “as new” condition after the repair.